At first glance, it might seem like Mormon was saying that Christ visited the Nephites sometime near the end of the 34th year. Because Christ’s resurrection happened at the beginning of the same year (see 3 Nephi 8:5), this interpretation would require that most of the year had transpired between the two events. Another possibility, however, is that Mormon was simply saying that Christ’s ministry occurred sometime before or by the end of the 34th year.2 If so, then Mormon’s description of Christ visiting the Nephites “soon after” his ascension would seem to support a timeframe closer to the beginning of the year. Due to conflicting interpretations about this passage, as well as a number of other textual considerations, various scholars have proposed differing views about the timing of Christ’s visitation to the Nephites.3 This confusion may lead readers to wonder why Mormon wasn’t more specific in detailing the chronology of this important event in the first place. In a fortunate irony, it seems that the confusion about the timing of Christ’s visitation in 3 Nephi may actually be a clue to the text’s deeper symbolic meaning. This situation teaches an important principle: what the scriptures don’t say is sometimes just as important as what they do say. Whenever we are puzzled or confused about something, we might productively ask ourselves what information we are lacking and then ponder upon why it might not be available. In this case, the lack of time-related details in the record of Christ’s ministry suggests something about God’s eternal nature and the perspective we need when approaching Him. Doctrine and Covenants 88:13 states that God is “in the bosom of eternity” and “in the midst of all things.” From His eternal perspective, He gazes upon the past, present, and future. “Endless” is His name, says Doctrine and Covenants 19:10, and eternal life is what He promises to all those who keep His commandments.8 In order to come into God’s presence, we must therefore learn to share His eternal view. In many ways, this reorientation of perspective—from finite to infinite and from mortal to immortal—characterizes Christ’s temple sermon. He taught His followers to lay up treasures in heaven rather than upon earth, “where moth and rust doth corrupt, and thieves break through and steal” (3 Nephi 13:19). He taught them to “take no thought for your life, what ye shall eat, or what ye shall drink; nor yet for your body, what ye shall put on” (v. 25). Instead, they were to trust that their “heavenly Father knoweth that ye have need of all these things” (v. 32). Finally, Christ summarized, “Take therefore no thought for the morrow, for the morrow shall take thought for the things of itself. Sufficient is the day unto the evil thereof” (v. 34). In other words, they were to focus their minds on heavenly things first and then earthly things would follow (see 3 Nephi 13:33). In keeping with this theme, Mormon’s usual attention to chronology is replaced by a sublime focus on Christ’s temple-related teachings, covenants, and blessings. With Mormon as our guide, it’s as if we too get to enter a scriptural holy of holies, a place where time stands still and eternal principles and truths are manifested unto all who are spiritually prepared. As we read of Christ’s ministry at the temple, we can feel His presence in our lives and, for at least a brief period of time, symbolically join Him in eternity. 1. See Book of Mormon Central, “Why Did Jesus Deliver a Version of the Sermon on the Mount at the Temple in Bountiful? (3 Nephi 12:6),” KnoWhy 203 (October 6, 2016); Book of Mormon Central, “Why is the Sermon at the Temple Echoed throughout the Rest of 3 Nephi? (3 Nephi 16:6),” KnoWhy 208 (October 13, 2016). 2. An example of this same type of phrasing, with “in the end” most likely meaning “by the end” can be seen in Helaman 2:13: “And behold, in the end of this book ye shall see that this Gadianton did prove the overthrow, yea, almost the entire destruction of the people of Nephi.” Because Gadianton’s influence was not strictly confined to the end of the account which Mormon took from the “book of Nephi” (v. 14, emphasis added), it follows that Mormon’s mention of “in the end” appropriately means “by the end.” Only when readers carefully follow the Gadianton movement throughout Mormon’s record do they see how his influence eventually led to ultimate destruction. 3. For those who favor or assume a later date, see Brant A. Gardner, Second Witness: Analytical & Contextual Commentary on the Book of Mormon, 6 vols. (Salt Lake City, UT: Greg Kofford Books, 2007), 5:327–330; S. Kent Brown, “When Did Jesus Visit the Americas?” in From Jerusalem to Zarahemla: Literary and Historical Studies of the Book of Mormon (Provo, UT: Religious Studies Center, Brigham Young University, 1998), 146–156; Joseph F. McConkie, Robert L. Millet, and Brent L. Top, Doctrinal Commentary on the Book of Mormon, 4 vols. (Salt Lake City, UT: Bookcraft, 1987–1992), 4:50; Bruce R. McConkie, The Mortal Messiah, 6 vols. (Salt Lake City, UT: Deseret Book, 1981), 4:307; J. N. Washburn, Book of Mormon Lands and Times (Bountiful, Utah: Horizon Publishers, 1974), 186; Sidney B. Sperry, Book of Mormon Studies (Salt Lake City: Deseret Sunday School Union Board, 1947), 101; The Book of Mormon Testifies (Salt Lake City, UT: Bookcraft, 1952), 294; Book of Mormon Compendium (Salt Lake City, UT: Bookcraft, 1968), 401. 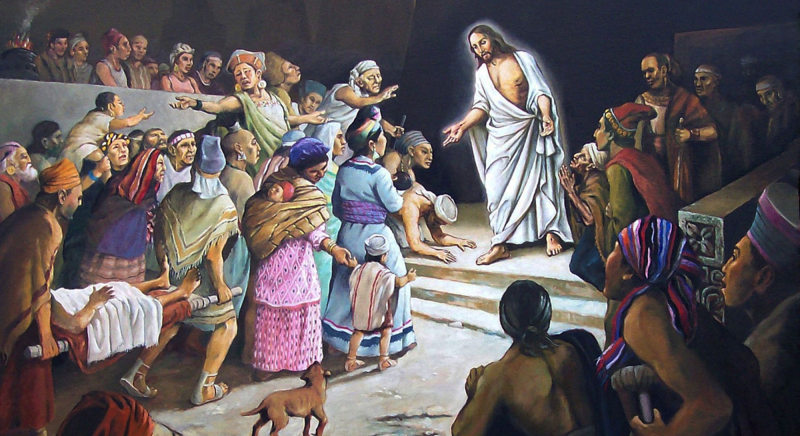 For scholars who lean towards or assume an earlier timing of Christ’s visitation (although not necessarily immediately after his resurrection), see John W. Welch, Illuminating the Sermon at the Temple and the Sermon on the Mount (Provo, UT: FARMS, 1999), 36–42; John A. Tvedtnes, The Most Correct Book: Insights from a Book of Mormon Scholar (Salt Lake City, UT: Cornerstone Publishing, 1999), 251–269; Reid E. Bankhead and Glenn L. Pearson, The Word and the Witness: The Unique Mission of the Book of Mormon (Salt Lake City, UT: Bookcraft, 1970), 34; Milton R. Hunter, Christ in Ancient America (Salt Lake City, UT: Deseret Book, 1959), 97–98; James E. Talmage, Jesus the Christ, Reference Library mass-market edition (Salt Lake City, UT: Deseret Book, 1990; first published in 1916), 673. 4. John W. Welch, “Seeing Third Nephi as the Holy of Holies of the Book of Mormon,” Journal of the Book of Mormon and Other Restoration Scripture 19, no. 1 (2010): 46. 5. See Book of Mormon Central, “What Makes 3 Nephi the Holy of Holies of the Book of Mormon? (3 Nephi 14:13–14),” KnoWhy 206 (October 11, 2016). 6. Welch, “Seeing Third Nephi as the Holy of Holies,” 46. 7. Welch, “Seeing Third Nephi as the Holy of Holies,” 46–47. 8. Catherine Corman Parry, “Eternal Life,” in The Encyclopedia of Mormonism, ed. Daniel H. Ludlow (New York, NY: Macmillan, 1992), 2:464–465.